I love decorating my lawn and garden but unfortunately, some decorations can be really expensive. I checked out some lawn and garden décor at my local home improvement store recently and absolutely could not believe the prices! Of course, I prefer the DIY way anyway, so I thought that maybe this year I would create my own garden décor. 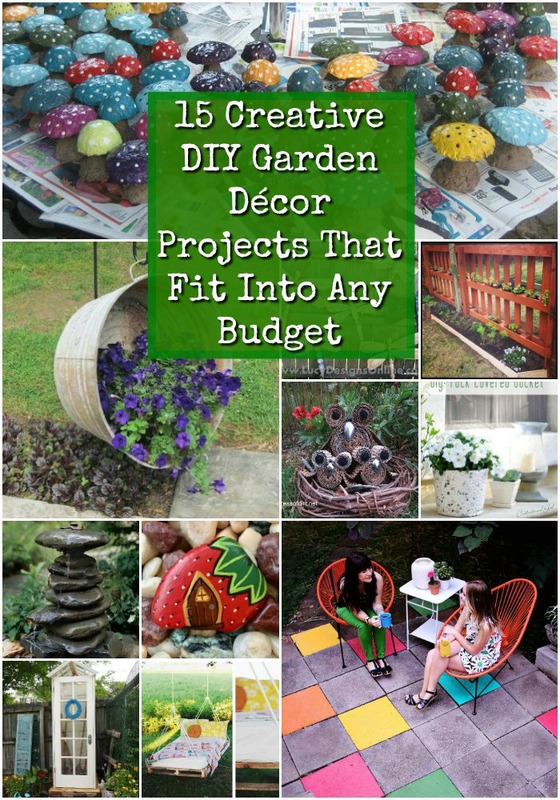 And, in the process of finding what I wanted, I also found 15 creative DIY garden décor projects that you can build, too. These are all so easy to make and they fit into any budget! Whether you want something to decorate the porch, like a faux succulent monogram or you prefer something in the garden like a rustic bucket planter, you are definitely going to find something in this list that will help you to spruce up your outdoor living spaces. Many of these can be made with repurposed or reclaimed items, like rocks or pebbles, which makes them even cheaper to make. And, all of them would make wonderful gifts for other gardeners, like these 20 unique DIY gifts for gardeners. If you are looking to add some décor to your garden this year but your budget doesn’t allow for $100 planters or other expensive items, you can definitely use these 15 DIY garden décor projects. Not only are they going to save you money over buying them, they are really going to help you to improve your curb appeal, and maybe even make your neighbors just a bit jealous. I hope you love these easy gardening projects as much as I do and I hope that you will also check out these 20 practical DIY ideas to organize your lawn and garden. They are also really budget friendly. This monogram is made from fake succulents and it is perfect for adding some décor to your garden. You can buy faux succulents at any hobby or craft store and they’re pretty cheap. 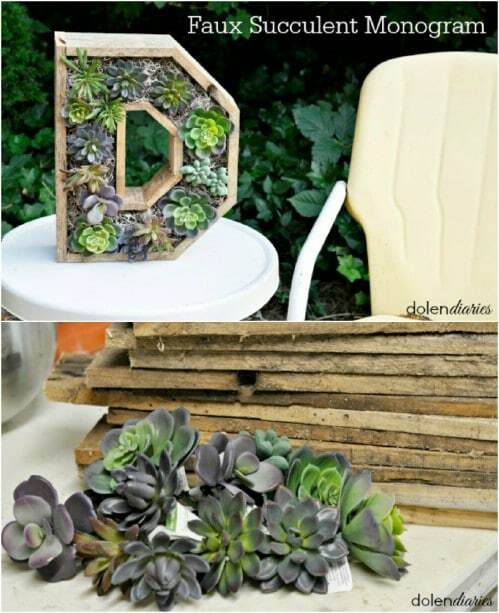 If you aren’t a fan of growing your own succulents or you just want some cheap and easy outdoor décor for the garden, you can create this monogram in about an hour or so. You can also use real succulents if you prefer, and stand this up right in the middle of your DIY backyard succulent gardens. 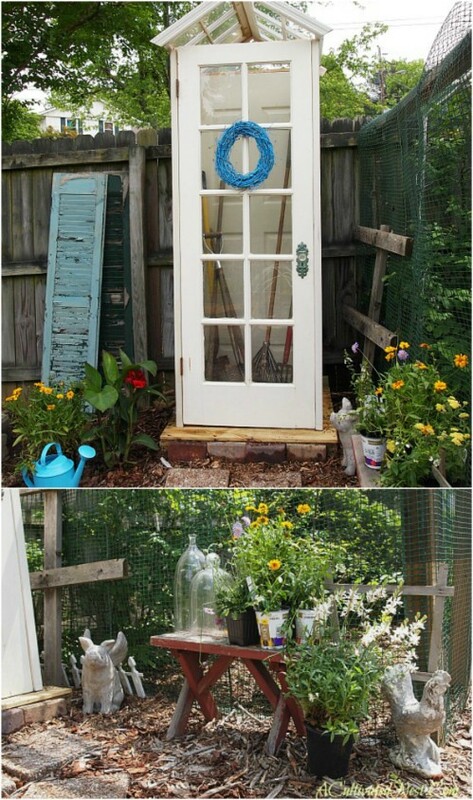 Not only is this DIY garden shed cheap to make, it also adds beauty to your lawn and garden area. You make this with all upcycled materials, like old doors and windows, and you can paint or stain it however you want to match your existing outdoor décor. It’s a wonderful place to store garden tools and a beauty when it is finished. 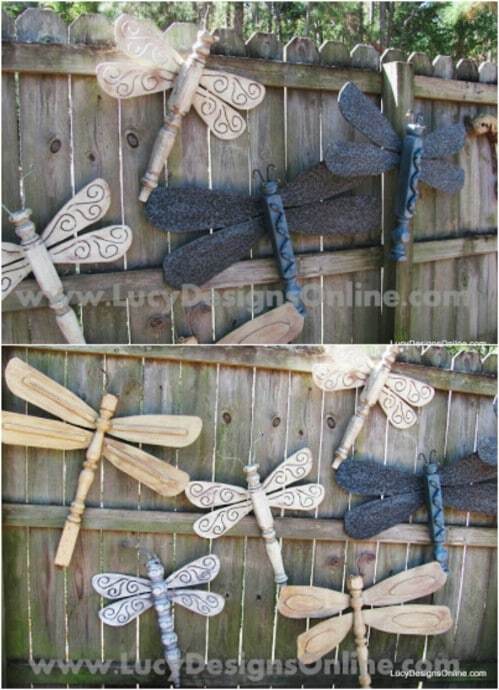 This gorgeous wooden dragonflies are made from repurposed materials and they are gorgeous hanging on the fence or the side of your house. You make these with upcycled table legs and old wooden ceiling fan blades. You can find all of the materials at your local thrift store really cheap and putting them together is really simple. These are so cheap to make and are beautiful when they are finished. 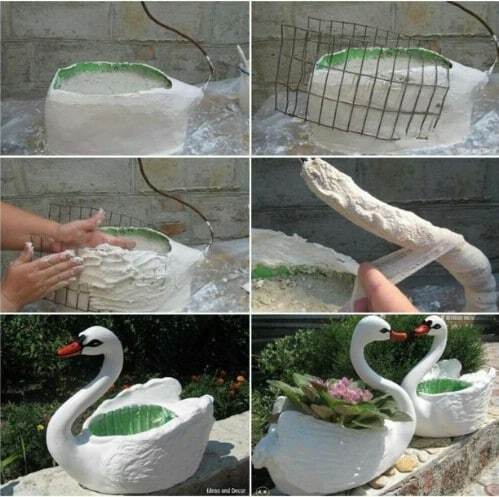 These DIY geese planters are made from upcycled two liter soda bottles and plaster. They are really easy and when they’re finished, they are absolutely stunning. You can set these around in the garden and add small plants or succulents to them for added décor. This is a great way to recycle plastic bottles and get some cheap and gorgeous DIY garden décor at the same time. This is such a fun and creative craft for empty soda bottles. A small table in the garden gives it so much character, especially when that table has a gorgeous mosaic top. 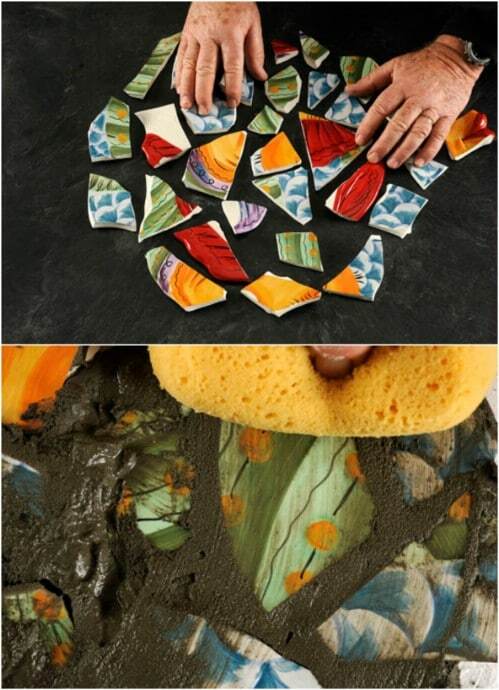 You can make your own mosaic tabletop with some old broken plates or saucers and save a fortune over buying one. This is a great project to create a couple of stunning pieces for the garden and if you happen to have some broken dishes on hand, this one won’t cost you anything to make. 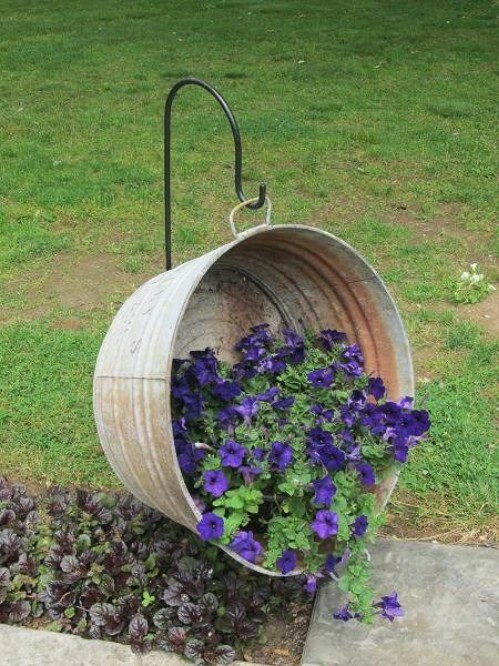 An old galvanized tub and a garden flag hanger are all you need to create this stunning look. You just loop one of the tub handles through the hanger and then use it to cascade some of your favorite vining blooms or plants. This is such a quick way to add some extra décor to your garden and if you have an old galvanized tub and a flag hanger, this one is completely free to make. DIY garden stepping stones are a wonderful way to add some lovely décor to your garden for cheap. These in particular are really lovely. These DIY lace stepping stones are made from regular concrete stepping stones. 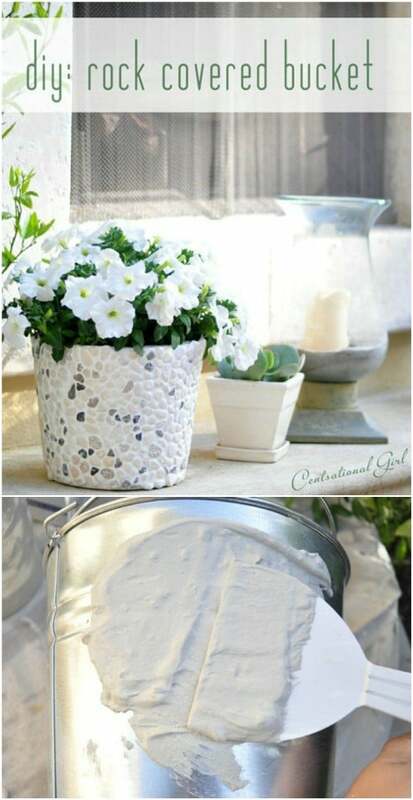 You add the lace look with a few cans of paint and a lace doily and they instantly dress up your garden. DIY garden stepping stones are a great way to add décor without spending a lot of money. 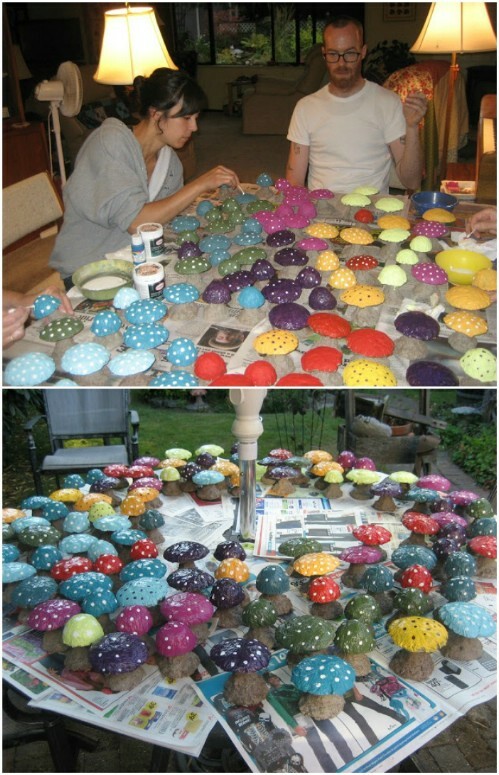 These little DIY concrete mushrooms are perfect for just sitting out in the garden in numerous places. They give your garden area so much style and décor and they honestly couldn’t be easier to make. You can make several of these with just one back of concrete so it’s a really cheap project and once you have them all finished, you can paint them in any number of fun colors. What could possibly be more relaxing than a swinging bed in the garden? 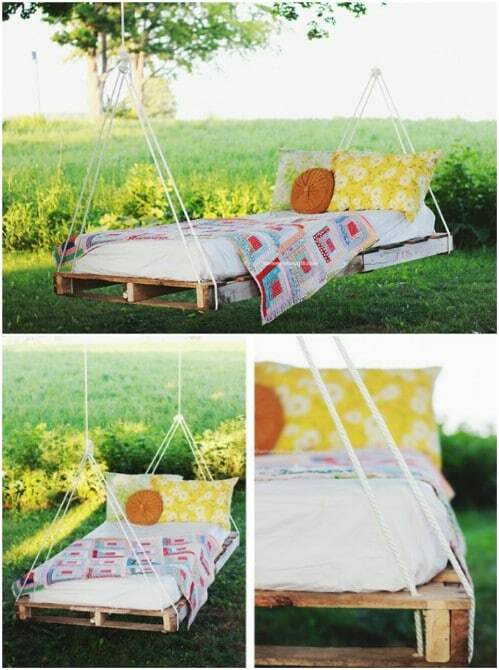 You can easily make your own DIY swinging bed for the garden with a couple of old pallets and some DIY cushions. This is a wonderful idea to add a relaxing look and feel to your garden area or if you don’t have room in the garden, you can attach this one to the top of your roof or deck and make it a swinging porch bed swing. These little garden owls can be made from upcycled cardboard and they are the perfect way to add some cheap décor to your garden. Since these are made with cardboard, you will want to keep them somewhere that they will stay dry, so they’re better for under the porch or deck roof. 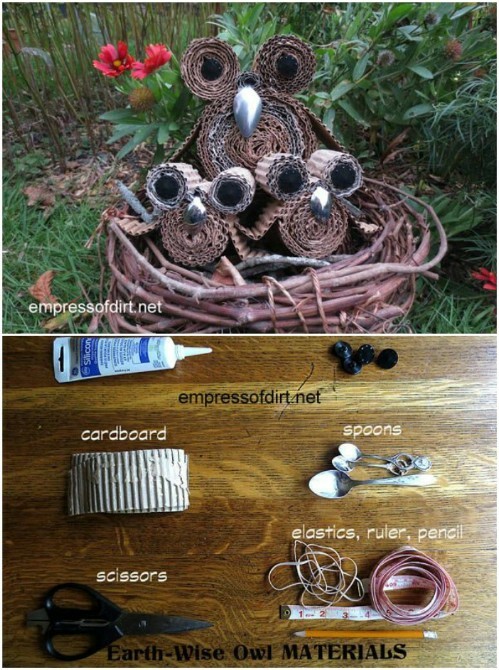 You can make an entire family of owls, complete with a DIY grapevine bird’s nest. Add this one to your list of repurposing ideas for cardboard boxes! 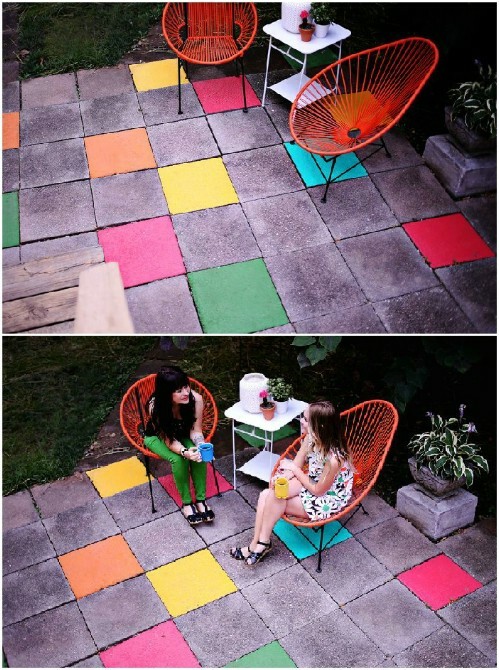 If you want to instantly spruce up the garden and you want to do it for cheap, why not just add some colorful paint to your patio tiles? This is honestly one of the easiest ways to add some lovely garden décor and it will only take you an hour or so to complete. You don’t even have to paint all of your tiles – just choose a few to really stand out. You can do this with concrete stepping stones, as well. 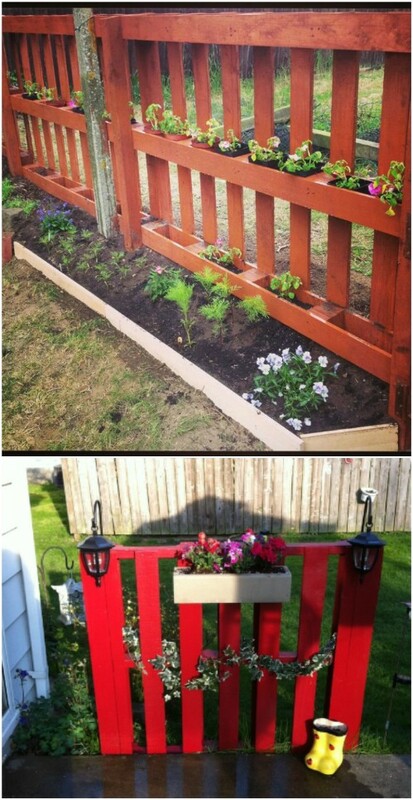 This DIY garden accent fence is made with a single pallet and it is a really cheap and easy way to add some décor to your garden. You just paint the pallet and then add any additional décor that you want to include. Hang a DIY window box for flowers or add some lighting to the corners. These are so easy to make and will instantly spruce up your garden area. A cheap little bucket and a few decorative rocks will give you all you need to create these lovely planters that will create quite the focal point in your garden. You can use rocks that you find outside for this one, which makes it really cheap. Even if you have to buy the rocks, you won’t spend more than about $5 each for these planters if you get all of your materials at the Dollar Tree or Dollar Store. 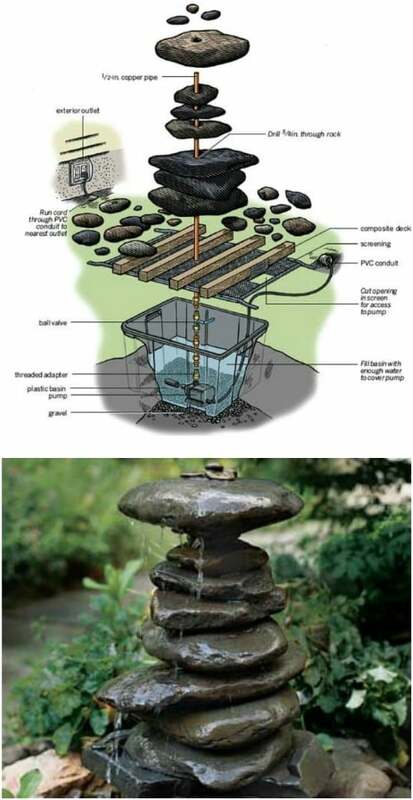 To make this DIY stacked rock fountain, you do need a few store bought supplies like a fountain pump, but you build the actual fountain yourself from rock so it’s much cheaper than buying a decorative garden fountain. You can finish this one in just a day’s time, and still have time left over to relax beside your new fountain and enjoy its beauty. This would look great standing next to your DIY garden ponds. 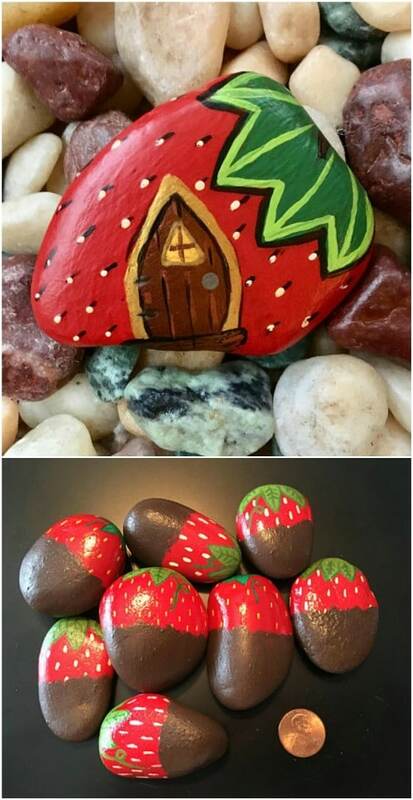 Add some color and spring fun to your garden with these adorable little strawberry rocks that you paint yourself. These are so simple – and super cheap to make. You just need the paint and then you can use rocks that you find in your yard. This is a great way to reuse those pesky rocks and to get some cheap and easy DIY décor for the garden. all of these projects are so creative and lovingly made. such good work.